Not many rivers allow you to paddle through the “birthplace” of the blues among other historical landmarks, but the Mississippi’s Big Sunflower – America’s Most Endangered River of 2018 – does. 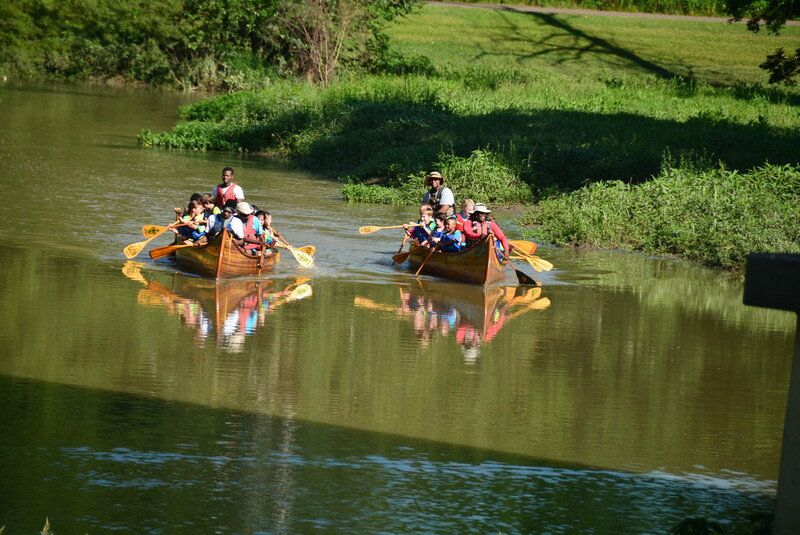 This guest blog by John Ruskey, with Quapaw Canoe Company, is a part of our America’s Most Endangered Rivers® series on the Big Sunflower River. This river has the blues! Besides the many blues and gospel musicians who were born and baptized along its banks, its mussel shell beds, which are reported to be the richest such biota in the world, seem to be in constant danger of overzealous engineering. 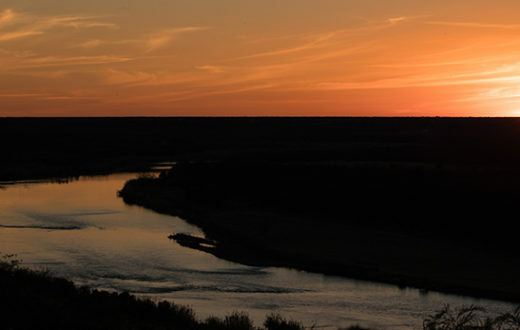 The Sunflower River has been neglected, dumped upon and over-worked — so much that American Rivers has proclaimed it to be America’s “Most Endangered River” in 2018. 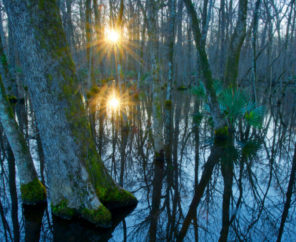 The good news is that its forests constitute the largest bottomland hardwood forests in the National Forest system (they also produce the highest carbon-sequestration of any forests in North America! 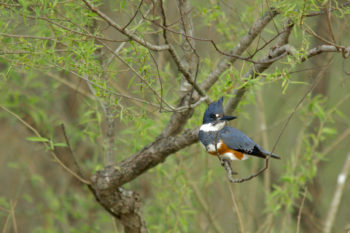 ), and its banks are home to every creature found native to the Mississippi Delta, winged, webbed, or otherwise. It’s a beautiful place to get away, to reflect a moment on the rivers and woods of America, to walk along its banks, to paddle its waters, to enjoy its primeval scenery. Most importantly, it’s home to all of us who live on or near its banks, and second home to many others who love it from a distance. Shouldn’t we be taking better care of our lonely muddy river — the little lonely river with a bad case of the blues? 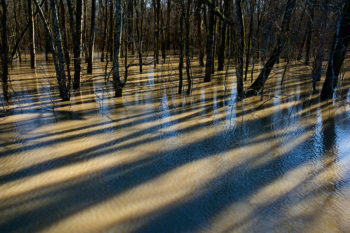 The Sunflower River is sometimes difficult to access, in part because it is carved out of the deep mud of the Lower Mississippi Alluvial Valley. Nevertheless it is well worth the effort to explore. Paddlers are rewarded with abundant birds, amphibians and mammals, deep woods, endless wetlands, and the rich culture of the Mississippi Delta. How many rivers can you put-in near the Delta Blues Museum (Clarksdale), paddle behind the most active juke joint in the world (Red’s in Clarksdale), meander though the “birthplace” of the blues (Dockery Plantation), visit another legendary juke joint Club Ebony (BB King’s haunt in Indianola), and end up near the birthplace of Muddy Waters (Rolling Fork)? 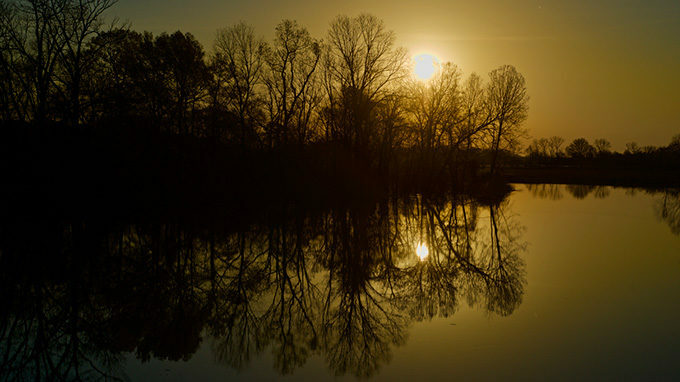 The Sunflower River is born in the bayous and lakes of Northern Coahoma County and meanders South some 250 miles through the Yazoo-Mississippi Delta paralleling the Mississippi River on the West and the Yazoo on the East, (with which it confluences with 10 miles above Vicksburg). A small but dynamic river, once forested, now mostly bordered by fields, the Sunflower is a rich habitat for all creatures native to the region, including black bear and panther. Its muddy current averages 2100 cfs (cubic feet per second) at Sunflower, 3461 cfs at the mouth of Bogue Phalia, and approximately 4500 cfs where it empties into the Yazoo River at Steele Bayou. Its drainage includes most or all of Coahoma, Bolivar, Sunflower, Washington, Sharkey, and Issaquena Counties, some 3,689 square miles, inhabited by 133,075 people (2017 estimate, US Census). The Sunflower and the Yazoo parallel each other (and not coincidentally the Mississippi River) for the majority of their North-to-South journey, but come from widely different origins. 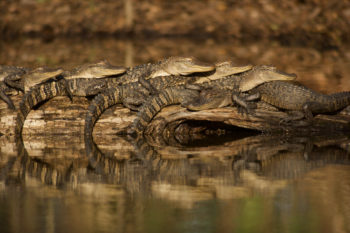 While the Sunflower emerges from the bayous of the North Delta, the Yazoo gurgles out of the Kudzu-covered Piney forests of the Mississippi “Hill” Country, in the form of the Coldwater River. Later it merges with the Tallahatchie (Bobby Gentry: Ode to Bille Joe), and then at Greenwood meets the Yalobusha to form the Yazoo. It also passes through Sledge (home of Charlie Pride), Marks, and Yazoo City. Greenwood was once the cotton stock market capital of the world, and Robert Johnson was reportedly poisoned in a nearby juke joint. Emmet Till was murdered on one of its bayous, igniting the stormiest period of the Civil Rights era. All Mississippi rivers have the blues to some extent, but the Sunflower has the blues worse than any other. In its journey through the Delta, the Sunflower winds through the layers of mud and history that gave the world its first great blues singer (Charlie Patton, Dockery Plantation), the first mechanized cotton picker (Hopson Plantation), its oldest African-American founded community (Mound Bayou), rural Civil Rights era leaders (Fanny Lou Hamer, Sunflower County; Aaron Henry, Clarksdale), the Teddy Bear (President Theodore Roosevelt was in the Delta National Forest (reportedly somewhere near Little Sunflower Recreation Area) hunting bears when the idea of the teddy bear toy was created. ), King of the Chicago Blues (Muddy Waters, born in Rolling Fork, lived 25 years at Stovall) and the renowned ambassador of the blues (B.B. King, Indianola). The Rev. C.L. Franklin (Aretha’s Father) is just one of many who were baptized in her muddy waters. Bessie Smith died at the G.T. Thomas Hospital which sits on her banks in Clarksdale (now the Riverside Hotel). Today you can hear live blues along the river at juke joints Red’s and Ground Zero Blues Club, and learn about the African American history that gave birth to this earth-shaking music at the Delta Blues Museum (Clarksdale) and the BB King Museum (Indianola). Legendary woodsman, Holt Collier (1846-1936), who cornered the Teddy Bear, reported its waters to run clear and clean, and Roosevelt started each day of the hunt with a cold-water swim. One of our long-term objectives is to make the waters safe once again for fishing and swimming. What would Roosevelt think if he returned to the deep forested lands he once hunted in and found their wetlands had been drained of water? Don’t look for sandbars on this river. You will encounter nothing but thick, rich Mississippi alluvial floodplain soil, and the fields and towns and forests adjacent. 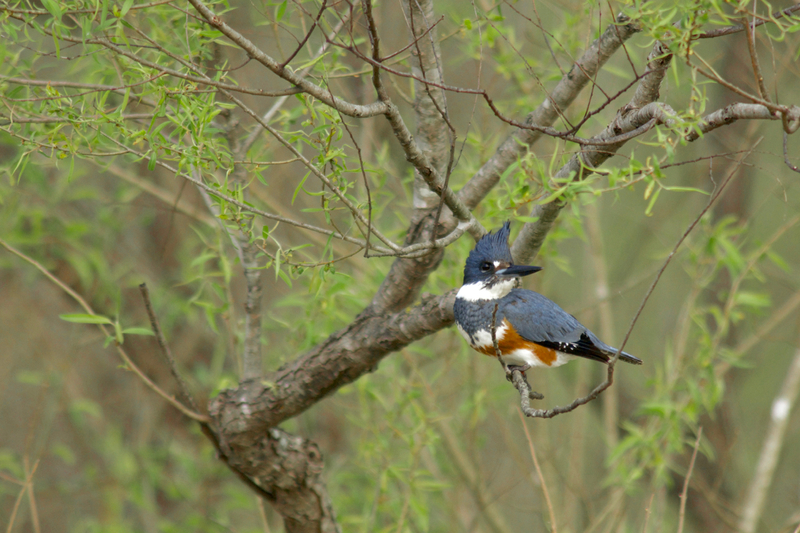 Exceptional wildlife, especially raptors and amphibians. Muddy banks make for muddy landings, muddy picnics, muddy camps. In high water the mud is all hidden. But in low water be ready for climbing and descending steep slippery banks of chocolate goo as you enter and exit the waterway. Of course, the end of one river is just the beginning of another, and so the Sunflower becomes a tributary of the Yazoo River at Steele Bayou. Not far downstream the Yazoo gets swallowed by the mother river, the Mighty Mississippi. There is an outdated plan to build the world’s largest freshwater pumps where the Sunflower joins the Yazoo, the so-called “Yazoo Pumps.” We in the Delta feel the effects of the problem the pumps are supposed to fix, that is “backwater” building up within the Mississippi Delta. We paddlers have some thoughts about this and the water situation everywhere, the lack of good water, the disappearing wetlands, the violent shifts of water levels from drought to flood, from extremely low water levels, to catastrophic flooding on all rivers in the middle of America. Why is this happening? In part because more rain is falling when it rains. 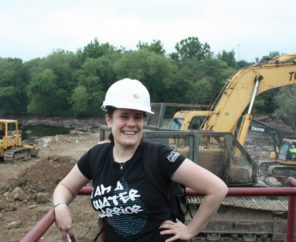 In part because we keep cutting off wetlands, like the Mississippi Delta, or building parking lots or neighborhoods, or increasing our farmlands in places where the river used to naturally expand, and its excess waters be absorbed in. I am but a canoe builder and river guide, and leader of a small group of adventurers, the Mighty Quapaws. But we do know the Sunflower river better than anyone else, if nothing else for the simple fact that we are the only people that actually get out and paddle it. Poor neglected rivers. They have become the closet you stuff all your unwanted things in — where your guests can’t see them. But what if your guests did see them? Then you’d start keeping it a little neater, wouldn’t you? And that’s what we are hoping with the Big Sunflower – we are hoping that these explorations and writings will take some of the fear out of the mud and trashy banks, and add a little respect and recognition of the beauty and great expressions of life – and that more people will get out and paddle it. As more people paddle, maybe the people who dump things over the bank will be less inclined to do so — and those who would build giant expensive pumps — and who knows, maybe with the attention of others they’ll even clean up some of the mess they made last year. It’s time to stop this terrible ‘Yazoo Pumps’ project and protect the Big Sunflower and it’s rich history once and for all. 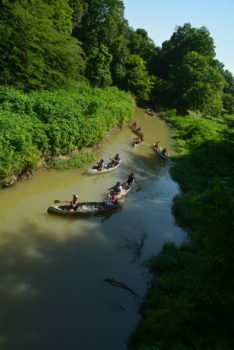 Where can you paddle the Sunflower River? 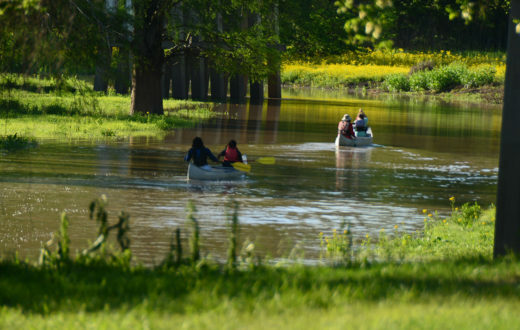 There are many places along the 250-mile length of the Sunflower River to access and paddle, but the best spots are found around Clarksdale and Rolling Fork. See below for complete listing and links to water trails in Clarksdale, Anguilla, and Rolling Fork. Canoe, kayak and paddle board are all suitable vessels. Hopson Plantation/Shack Up Inn: Start out near Red’s Juke Joint in downtown Clarksdale and paddle 5 miles downstream for a takeout at the Hopson Bridge, directly behind Friend of the Sunflower River supporting business Shack Up Inn. Put in at the confluence of the Quiver River, approx 8 mile paddle to the Hwy 49 Bridge below town. Walk 2 miles north into town to reach Club Ebony, BB King’s favorite juke joint. The phenomenal BB King Museum is located nearby. Good ramp on the old channel of the river off highway 16. Paddle upstream past the distributary Little Sunflower River, and meander deeper and deeper into the woods. Round trip: go as far as you feel like paddling, then turn around and return to your vehicle. 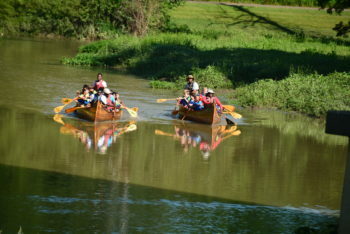 Steele Bayou Confluence: put in at the Steele Bayou Control Structure and paddle upstream ½ mile to the confluence of Steel Bayou, where steamboats used to start their journey up into the frontier Mississippi Delta. Yazoo River Confluence: put in at the Steele Bayou Control Structure for a one-mile paddle to the mouth of the Big Sun at the Yazoo, the “River of Death.” Enquire about further paddling options down the Yazoo River.